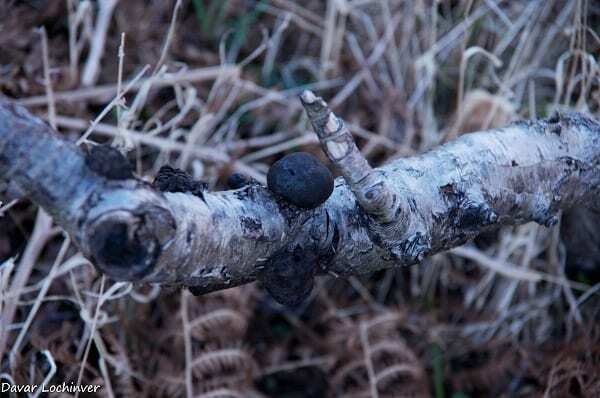 Dave McBain was on an archaeological field walk near Loch a’Phollain Bheithe, west of Oldany (NC0832) on 10th February when he photographed these black spherical fungi on a fallen branch of downy birch. Down in England, similar fungal fruiting bodies are a frequent sight on ash trees, where they are known as Cramp Balls or King Alfred’s Cakes. Those on ash belong to the species Daldinia concentrica, but these are a related but much less common species Daldinia fissa. They are ascomycete or cup fungi living on dead wood, and the fruiting bodies are perennial; if you cut one through you can see concentric rings of spore-bearing tissue, hence the name of the commoner species. Dave first found this fungus in February 2015 south of the River Kirkaig in West Ross, when it was named by Bruce Ing. This appears to be the first record for Assynt and for West Sutherland as a whole. NBN shows just four other records for Scotland, so this is quite a discovery, and something to look out for locally.